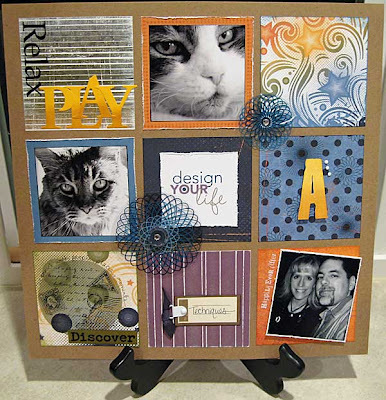 I’m taking Design Your Life with Cathy Zielske at Big Picture Scrapbooking. I wanted to take this class the first time it was offered but didn’t have time. Well, I still don’t have time, but I’m choosing to make the time. I am so excited to learn about design principles. Plus, she is providing PDF files for all the lessons, so I’m going to get to practice some digital scrapbooking along the way! Here is my first layout. The assignment was to use the grid pattern but to add our own touches to tell the story of why we love to scrapbook. I played around with a bunch of techniques on this one since I know I won’t have time to do much playing once school starts. Once again, I’m using the You Rock WOTG kit! Wow, you have been busy! These are all great! Awesome !I look forward to hearing more about the class. And, I am so loving this paper pack.